Past board president Mauro Hernandez (lt) passes the gavel to current board president, Darrin Buckner. For some, their calling in life is formed early on by specific experiences from their childhood. Such was the case with Housecall Providers new board president, Darrin Buckner. His close proximity to both sets of grandparents in Salt Lake City, Utah helped to form his passion for working with the senior population; a passion that has defined the course of his professional career. “I was the second oldest of 26 cousins and lived very close to each set of grandparents,” Darrin stated, “so I had the luxury of knowing them as a child and then as an adult”. While pursuing a degree in Behavioral Science at the University of Utah, he worked as a certified nursing assistant at an Alzheimer’s and dementia community called Garden Terrace. It wasn’t long after completing his degree that he was invited to become a social worker at the facility. When an opportunity in Portland, OR opened up for an administrator at St. Jude Specialty Care, he seized it. It was at St. Jude’s where he learned about Housecall Providers. “Dr. Sperlin was making house calls to four of our residents, each had pretty progressive Alzheimer’s disease and I remember thinking what an incredible service he was providing,” Darrin stated. “A colleague at the time, Josephine Lin, was on the board of directors so that is how I came to be part of the organization.” Currently, Darrin is the executive director at the Springs of Clackamas Woods, a senior living community in Milwaukie, OR. Darrin joined the Housecall Providers Board of Directors in September of 2010 and his impact was felt immediately. On the board, Darrin became involved in various committees including fund development, strategic planning, Quality Assurance and Performance Improvement (QAPI) and most recently, the executive committee. 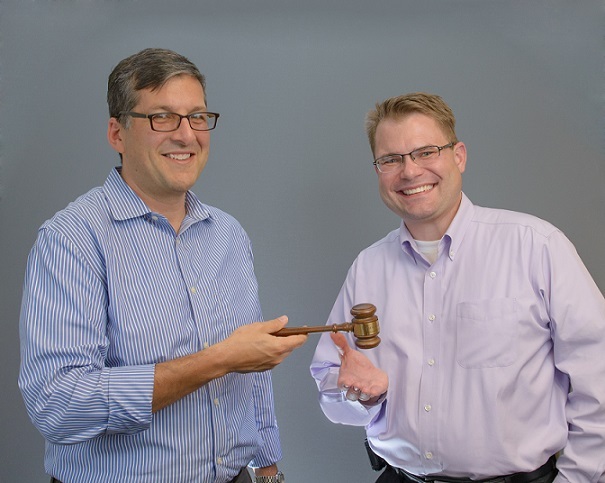 He was handed the gavel from outgoing president Mauro Hernandez who has served as board president since 2012. Dr. Woody English has assumed the role of president-elect. “My biggest goal as president will be to maintain the continuity and collaborations that exist at Housecall Providers. I think the board functions very well and I have always appreciated the different background and perspective that each member brings to the organization,” Darrin said. He is assuming this leadership role during a uniquely challenging time for the organization. Housecall Providers has experienced tremendous growth over the last two years and this fall founder and current medical director Dr. Benneth Husted is set to retire. “I think it is time for us to settle in and make sure that we are continuing to follow our mission and the accompanying values that have made this organization so great. It will be difficult not having Benneth here, but we have such a solid foundation and committed staff that the work will continue seamlessly,” he continued.